Today marked the final day of GP3 Series™ post-season testing in Barcelona, and the teams were greeted with sunny but cold conditions in the morning. There were no new faces in the paddock with the driver line-up remaining unchanged from Day 1 and MW Arden’s Mitch Evans the man to beat. When the lights turned green the twenty-six young drivers fed out onto the track on Pirelli P Zero slick tyres, but the session came to an abrupt halt when Aaro Vainio went off track at Turn 1 on his installation lap. 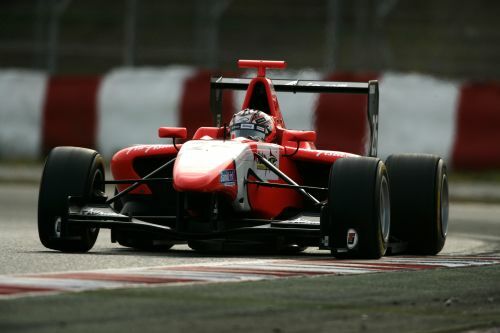 Once back underway it was Matias Laine who set the pace for Marussia Manor Racing before being briefly knocked off the top spot by MW Arden’s rookie Tio Ellinas and teammate Gabby Chaves. Laine reclaimed P1, but it was short lived as Evans continued to impress. The New Zealander moved to the top of the time sheet just one hour into the session and with the rest of the field unable to match his pace, held onto the spot for the remainder of the session. Laine clocked the second fastest time followed by a solid team effort from Jenzer Motorsport’s Maxim Zimin, Michael Heche and Brandon Maisano. In the afternoon temperatures conditioned to rise and once again it was Evans who set the early pace. The MW Arden driver topped the field until thirty minutes into the session when Laine took the lead. The Marussia Manor Racing driver moved into P1 and swapped fastest mid-session lap times with Atech CRS GP driver Tamas Pal Kiss and Vainio for Lotus ART. But with ninety minutes remaining Evans gained control once again. In the closing minutes of the session drivers headed out on new rubber, but despite the best efforts of the field the MW Arden driver had already done enough stay top – the young Kiwi made it four out of four at the Spanish circuit. Laine held onto second ahead of Ellinas who had an impressive debut test. Vainio finished fourth followed by Stockinger and Pal Kiss. GP3 Series will be back on track November 23-24 for the second post-season test in Valencia.